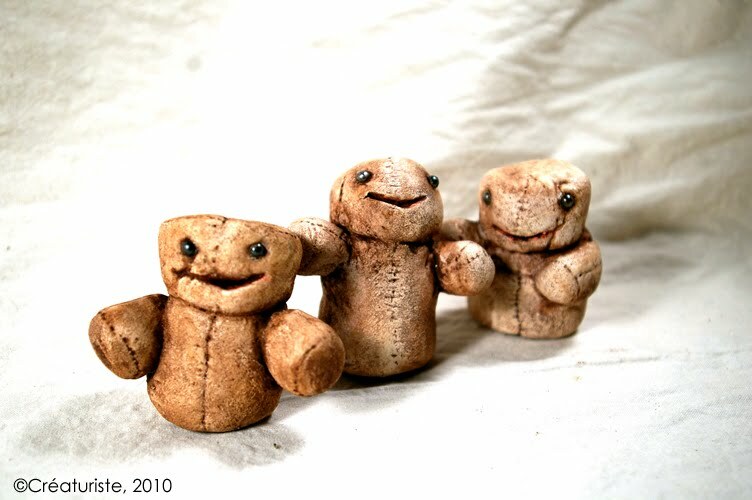 To all Strangelings, Misfits and Weirdos Out There, Happy New Year of 2011! 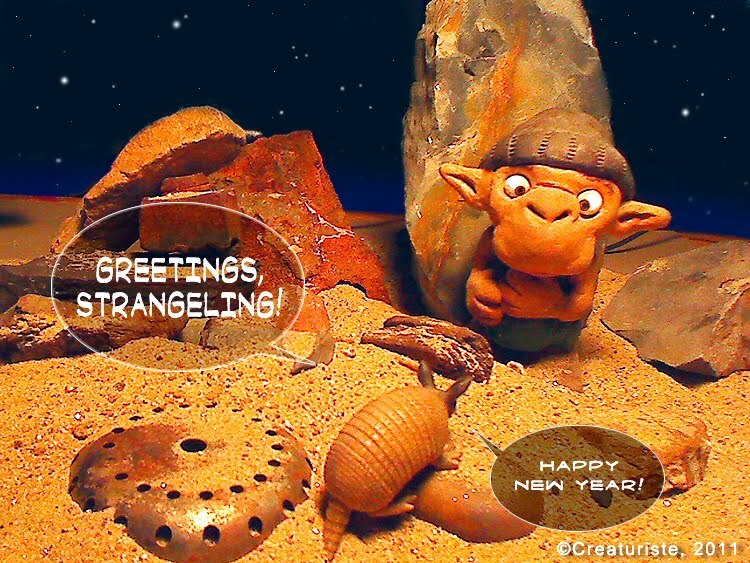 Wishes of Abundance and New Friendships to You and Yours, from Creaturiste, Poëk, Mr. Armadillo, and the rest of the ever-growing creature family! Wow. I have been snobbing tahini as a condiment for years. I was missing out! I didn't mind it if it was part of something else, but as a main flavor, forget it, it was too bitter for me. It's easy, healthy, almost raw, super refreshing, and super fast to make! •water, if necessary to dilute (though I now prefer to dilute with more lemon juice). Mix it all together until smooth and to the consistency you need. No need for a blender, I hand mixed it all. It does not imitate sour cream, but the taste seems to work where sour cream would. I already tried it in burritos, and as a veggie dip. Amazing! I am going to mix it thicker next time, add some ground peppercorns and herbs, and use it as veggie pate, for toasts, sandwiches and crackers. You won't believe it until you try it! And please let me know if it already exists as a tradition under another name, so I can research it and add the info here. One more recipe for the busy artists who appreciate good food, but don't have much time to prepare them. My Iced Tea (sweet tea) is very appreciated by my guests. It's an easy 10 minutes to make, takes about two hours of freezing to be ready, so I make it in advance, when I know someone is coming. Ever since I succeeded making it to my taste, I can no longer appreciate the overly sweet chemical "drink" that is called Nestea. Real Iced Tea should be fresh made, therefore fresh-tasting, and not too sweet! Needs to be loose leaf & organic. I personally prefer Sencha, a Japanese green Tea. Variation: for the hottest heats of summer, a blend of half green tea and half dried mint leaves is a really good combo. •4 cups of near-boiling water. •sugar or honey, to taste (I add about half a cup of raw organic sugar, or raw honey). •glass or ceramic teapot that can hold 4 cups. •fine mesh strainer, to filter the tea leaves. •Pitcher, needs to be freezer-safe (I use a plastic pitcher for this). 1. measure 2 heaping tablespoons of green tea leaves, and put in the teapot or glass jar. 2. Bring 4 cups of cold water to an almost boiling point, using a kettle. Using cold water to start with helps in keeping your drink unflat. 3. Pour the hot water onto the tea leave, and lest rest for 8 to ten minutes. Waiting longer will make a much more bitter tea. Some people step it for less than 8 minutes, but for me, it feels like a waste. You'll see what appears to be flakes or powder, turn into actual leaves, or big fragments. 4. pour the tea into the pitcher, using the strainer to catch the leaves. 5. Add the sweetener and blend while it's hot. A variation: sometimes I add the juice and a bit of inner pulp of two or three lemons at this point. 6. fill the rest of the pitcher with cold water, and blend well. Tasting it now should tell you how sweet it is. If it feels a bit weak now, you should add a bit more sweetener, as a cold tea seems to taste a bit less sweet. Observe the marvelous color! It may be called green tea, but often it looks more golden, with a green tint. 7. Put in the freezer, without a lid, for about two hours, or until chilled. 8. Dispose of your surprisingly big heap of tea leaves in the outdoor compost right away. They attract insects. Who knew fruit flies were THAT fancy? If it's winter time and you don't want to dig out the compost pile, you can leave it in the freezer or in a bucket outside until you have time to do so. 9. Issue a warning to your guests: this iced tea is known as a diuretic. It affects some people more than others. If you have a very small or very nervous bladder, start with one single cup, to see how it affects you. Hey, such a natural diuretic is a good thing, it cleanses you! Why not use Tea Bags? Why loose leaf and not tea bags? Commercial tea bags are low quality at best, and have barely any taste, in general. So "do yourselves a flaVor", and get loose leaf tea. Don't be fooled by the label at the store if it's sold by weight. Even at $10.00 a kilo, it's a bargain, since tea leaves are very lightweight. Different brands and types of green tea will taste different, because of how they are grown and processed. My most recent purchase of Sencha tastes more grassy than my usual supply, and that was a great surprise. If you like the convenience of tea bags, you can purchase empty bags and prepare your own. If I were to start using them, I would prefer the over sized tea bags, allowing me to prepare bigger batches, such as what is called for in this recipe. I have just found out, by a sudden moment of strange inspiration, how to prevent delamination of the first few surface layers of paper mache strips. 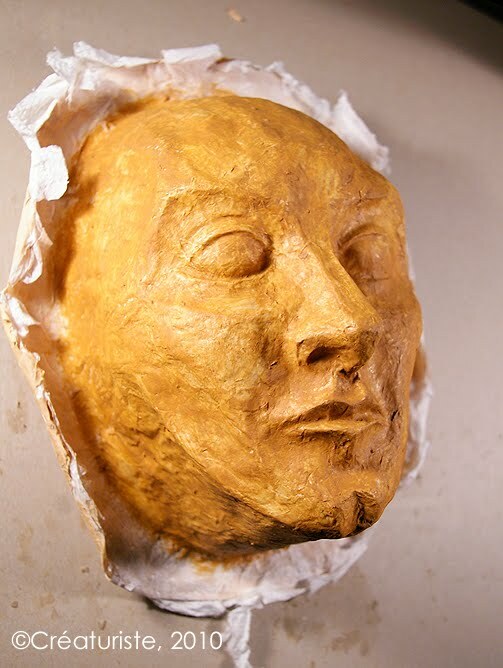 When using boiled wheat paste as a glue for paper mache strips within a negative mold, the release layer of paper towels or toilet paper and water, were always diffcult to really paste down and merge with the rest, once pulled out of the mold. Even worse, most times, some areas of the glued paper lift when applying the sealer. I never had those problems with PVA glues. I now use a paper pulp (with wheat paste as a bonding agent) to make the detail coat into the molds. It takes twice as long to dry, but that time is not wasted, as I get a better definition, and a bonus texture that I love. I then add 3 or 4 layers of thick Kraft paper inside, for the strength and stiffness I need. I'll repeat it here, to be clear: Wheat paste paper mache is far more stable in temperature changes than any PVA I've ever tried. PVA-glue paper mache strips: get it cold, it becomes brittle and can break into pieces if dropped or hit; get it hot, it becomes soft and can be warped or squished out of shape. Boiled wheat paste paper mache strips: no apparent change! I even froze a puppet head for a few hours, and then hit it violently, there was no change in strength! 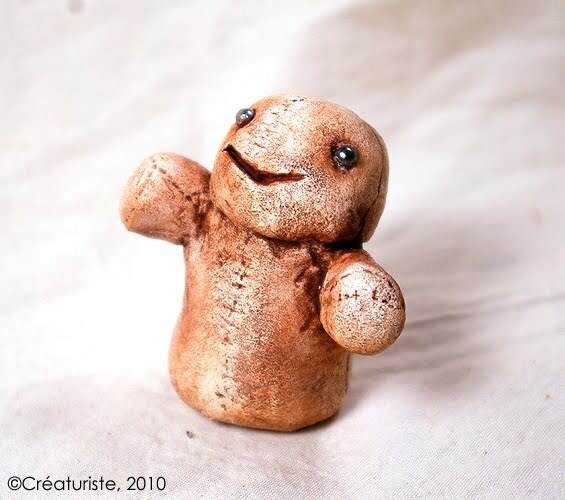 Add to this that wheat paste paper mache is by far stronger than PVA-based same, and you got the best choice: stronger, non toxic, smoother results, non-lumpy, very economical, available worldwide! This is where I got the info that made me want to try wheat paste again, at last! These are two of the multiple contracts I have been working on lately. The frog is a mouth puppet cast in one piece of latex. What you see currently is the cast inside the mold, as it appeared immediately when I opened the two-part plaster mold. I will offer copies for sale eventually, but if you want one before the weather gets cold in North America, you should order preferably before mid-September. I avoid working indoors with Latex, because of the ammonia fumes. 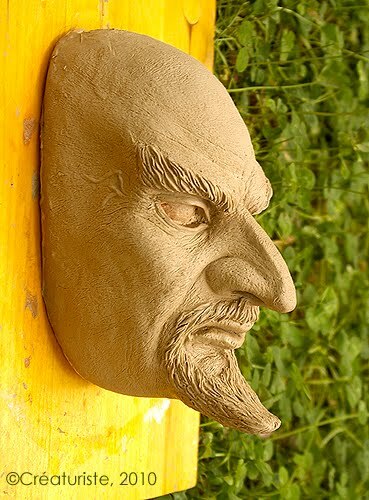 The Vizir (also known as the Evil Wizard) will be a latex mask (for the current customer) and will also be available as a paper mache version. I shall post the copies in my Etsy store as they become available. I've been unsuccessful in finding proper information online about how to REALLY keep brushes clean when using them to apply rubber latex for making molds. All the sources mention using dish soap, but all of them are absolutely unspecific about it. So years ago, when I first started using rubber latex, I wasted a few brushes. This past week, I've been working with latex again, both as final product and as molds (different projects). So I decided to solve this once and for all, after another intensive search turned no specifc methodical solution. Today, by simple logic and remebering what went wrong before, I found a method that works, and here it is! 1. choose a good quality long haired brush (I use a flat hogs bristle brush). The lenght gives it suppleness and bounce, allowing for softer and more precise application of latex. 2. Find a small narrow short jar, and fill it with liquid dish soap. It must be enough to cover all the jair on the brush, and part of the ferule (metal part). 3. dip brush into dish soap, gently press with your fingers to make sure the dish soap gets deep into the brush. This is an added precaution to ensure that the soap really is permeating every hair on the brush. 4. pour your rubber latex into a small container, such as a small pudding cup or a glass. Plastic is best, it can be cut to size, and cleans up easily: just peel off latex when dry. The small container makes it easier to handle the latex (compared to using the big jug or gallon container), and helps prevent dipping the brush too deep. 5. remove excess dish soap by rubbing against the mouth of the jar, therefore recuperating it. 6. Dip ONLY the end of the brush into the latex. This is important because the ferule'Ms exit for the hair is where latex and paint like to accumulate, and make the hair go wild and useless for precision work. Nearly impossible to clean once it is set there. Brush the latex gently onto your model, either by sliding or by stippling, using the tip of the brush, without applying much pressure. This is imprtant to keep proper detailing on the first three coats at least. DO NOT squeeze the excess latex back into your latex cup. You would contaminate your latex with dish soap, which could, in theory, cause structural problems on your project. 7. If your surface is large or complex and takes a while to cover, take a break after ten or 15 minutes, to wash your bush, even if you are not finished, and when the brush is clean, just redip in dish soap, and start working again. 8. CLEANING the brush: start with a squirt of dish soap in your hand (gloved if you are allergic to latex), mix the soap into the brush (tip only again), and then wash gently with COLD tap water. to water makes latex set instantly! DO NOT srub the brush into your hand. DO NOT reverse the brush to force water near the ferule. Those are very bad abuse on any brush, but alas quite common "techniques" in the artistic and construction fields. Better to gently brush your hands directionally, as if you were painting it. Repeat rinsing and soaping until you are sure thebrush is clean. Suspend upside down to dry. Occasionally, after a work session, it is good to treat your brush to a little bit of hair conditionner. It helps keep them alive longer. Just don't, forget to rinse toroughly, or else the conditonner would affect your next painting or moldmaking job. Found out after three days of using this method: there may be just enough residual dish soap within the depth of the brush to be enough to wash it without needing to add any more. 9. No matter what precautions you take, you will eventually get some small beads of latex forming at the end of your brush. Use more dish soap and rub it well. Then pinch those beads out of the brush. Here's to the health of your brushes, and more precision in your work! I've been using epoxy putty again tonight , because it was called for. I thought the following input could help people have a better experience with this useful but "particular" category of materials. Things can go wrong real fast with epoxies. •gluing or merging parts of very different materials (even for glass to wood to metal!). •Smoothing and patching an otherwise hard-to-repair material (only if paper mache is not suitable, such as for certain synthetic materials that are too slipery). And one more epoxy-based casting product, of which I have not been told the name, seems to share these issues with the putties. Three days ago, a heavy hollow puppet head from a colleague, cast in a supposedly flexible and lightweight epoxy material, got severely damaged when it was dropped from a table. The product had been highly recommended by another colleague of his, who got him the contract. BIG mistake. 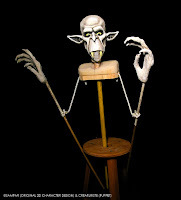 Caused a slew of technical problems for him and me, as well as puppeteering problems for the puppeteers (mostly weight and fragility, but also some air bubbles in the cast). So tonight, to help out, I repaired the head with epoxy putty. The big problem I had with the only putty I had access to tonight, after hardware store hours was Mighty Putty, which I got at the drugstore. The price was right for a change, but that may have been because it was old stock. No mention of it anywhere, but I know from past experience that this is what happens to putty when it spends too long on the shelf: sets way too fast, gets brittle and loses adhesion properties in 5 minutes (or less). A proerly fresh epoxy putty feels like warm bubble gum at first, is actually droopy for a minute or two. Tonight'"s stuff was already like firm modeling clay, and only sticky for two minutes or less. I wasted nearly half the package, because that's how much I mixed at once, and it set within 5 minutes, instead of the "minimum 20 minutes" advertised in the instructions. Next time, just because I obviously should not trust stores or suppliers, I shall mix a tiny amount at first, to test the batch. 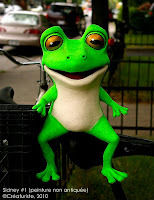 I'd appreciate it if people with different experiences with epoxy puttie would come froward and share their tips, so that visitors here can benefit. Especially if you know of a good, not-too toxic primer to use on the stuff. I have had an Etsy store for the past few months. Sales were very very slow, but today I sold 6 of the same item. One was a repeat customer (he bought one recently, wanted 3 more), and another also got 3. With this week's sale on the Mellow People, I may have found a product-price ratio that people want to spend. The more I make items one-by-one in a series, the faster I get. I am trying to get to a speed that's fast enough to turn into profit, but not so fast that it sacrifices quality levels. I might leave the Mellow people priced at 10$ after the sale. I also adjusted the price of the Beaverlions, those furry fridge magnets, at 10$. If you have suggestions on what you'd like to see in my store, please contact me. I also CRAVE custom orders, as they always bring new ideas and challenges. Don't worry, my prices are reasonable! You can check out my store by clicking on the big orange button on this very page. A few weeks ago, I made a test to see if I could create a skull cap for a fraction of the cost of the same thing I can purchase in plastic. "Skull cap" is a term that is nowadays applied to too many things to be of any clear meaning. The one I am referring to here is a hard cap that is often used in Theatre to create hats and helmets. Cover a bald head with a thick application of aluminum foil. The thickness becomes the extra space you will have inside the skull cap to install padding. Which is necessary, for a paper mache skull cap, as sweat would make it uncomfortable and sticky. Remove from head, cover foil cap OUTSIDE with plastic wrap, using masking tape to hold in place. Cover the OUTSIDE of the foil with paper mache strips. 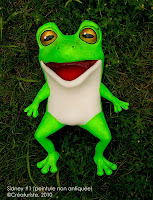 Check this blog for previous articles about strong paper mache practices. Basically, you use diluted white glue as a paste, and strong paper, such as thin Kraft paper, which has been softened by crumpling into a ball, soaking in water, and wringing out until no more water comes out. Tear in small pieces, apply over shape, using paste. 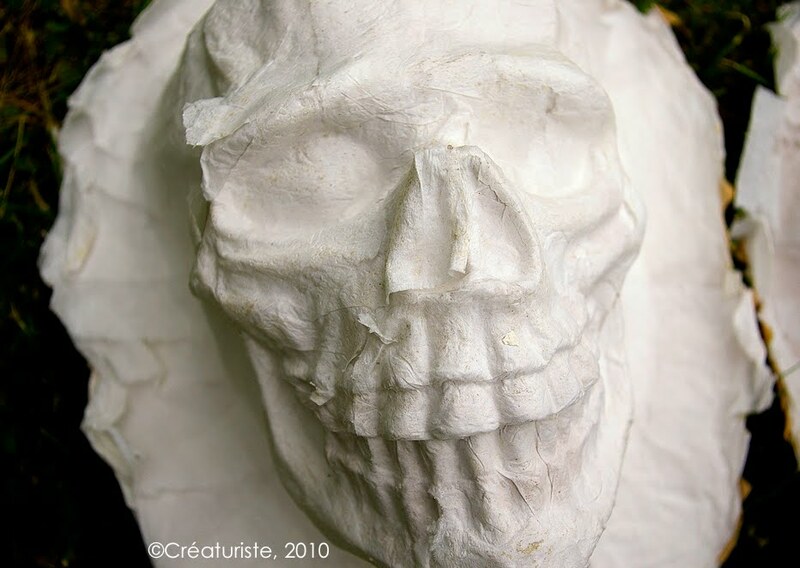 Remove paper mache cast from shape, remove plastic wrap and tape leftovers. Try it on, trim according to your needs. A skull cap should not irritate or rub against anything, including your ears, horns, or any wonderfully strange bumpŝ you or your customer may have. Strengthen and seal the edges, by adding strong wire on the edges, and covering with paper mache strips (same as described above). Once dry, this cap will not warp. Now is a good time to sign and date your work with a permanent, preferably lightfast, marker. Make sure you sign and date where there will be no padding added, so that it will always be visible. Seal the whole thing (inside and out) with two coats of water-diluted Weldbond (or diluted white glue, but Weldbond or Sobo are better). Let dry completely. Install padding. I prefer L200, which is the industry name for the colorful rubber product sold as Fun Foam (or Foamie). This material is easy to cut, glues wonderfully with hot glue, and is sweat-proof. The pads are small rectangular strips, installed regularly all around the head, but apart from each other, to ensure air and sweat circulation. Do not add padding where they would touch the temples of the wearer. This would cause headache-inducing pressure. Install skull cap inside mask or hat, or build mask or hat around it. I will add pictures of the skull cap one day, when this test is finished. Right now, it's only at step four, and I have no project for it. I may need it for next Halloween. I just bought this book from Okse, and I'm waiting for it with impatience! You can preview the whole thing at the following link. I met Okse on Blogtv, where he usually broadcasts daily, his interactive show being a wondermix of live painting, live cartoons, humour, and fun. If I were a cool rapper, with street cred, I'd be able to say with a straight face: "He got madd skillz!" This book was created live on blogTV, one cartoon at a time, with audience participation to choose topics. I've seen quite a few of these being drawn, and it feels extra special to think I'll have an actual book filled with these. • Click on "preview book"
In the past three days, I have been experimenting (finally!) with corn starch, as a glue for paper mache strips. So far, I've learned a lot about very desirable properties of starch, yet it brought more questions, as the issues showed up as I worked. 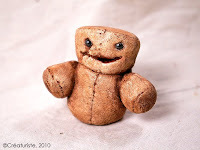 I am hoping some alumni of tradition, and current paper mache users will come out of the woordwork to help us understand what works and what doesn't, and why. Anyone here willing to share their insight? Yeah silly, why switch to something so complex, when white glue and water work so well already? You may wonder why am I so interested (dare I say haunted?) in moving towards more natural materials? I have always felt a bit uncomfortable about using so many synthetic materials to create my work, when at the same time I strive to be more eco-friendly and healthy in my profesionnal and personal lives. Those synthetics are usually much more damaging to the environment, from the moment they are created(transport+by-products+fumes), delivered (transported again, packaging) to the end of their use cycle (transport, waste) PVA adhesives are very sensitive to temperature changes, becomin softer in heat, and brittle in cold (albeit temporarily, it's enough to cause major damages or utter destruction). Also, synthetics are usually more expensive than raw materials, and come from specific suppliers. I prefer to buy local, to not be absolutely dependant on a single product (versatility and substitution are a must) and use supplies that will be easily available all year-round. I enjoy making my own art supplies, from relatively raw basic ingredients. So, using starch, such a common, inexpensive food ingredient, makes a whole lot of sense! Plus, it's been used by countless people, for many many years. 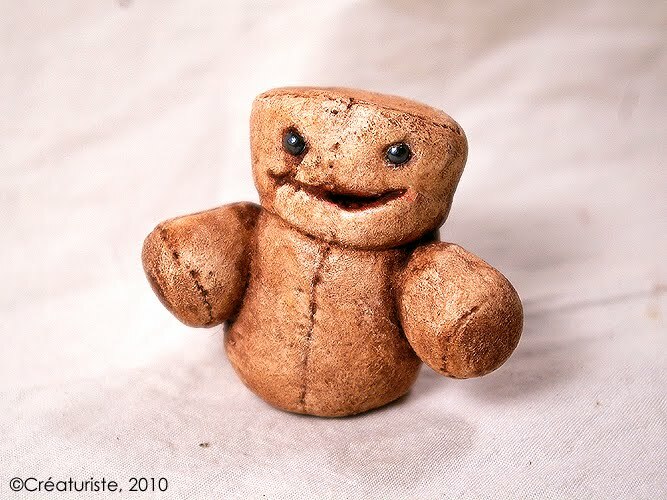 If it's good enough for The Bread and Puppet Theatre and Ronnie Burkett, it should be good for me! Skull on the left was the second test, and has better definition than the neutral mask on the right. 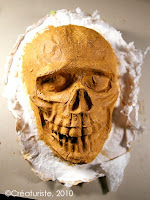 Difference: I used only one layer of paper towel strips (release-detail layer) on the skull. 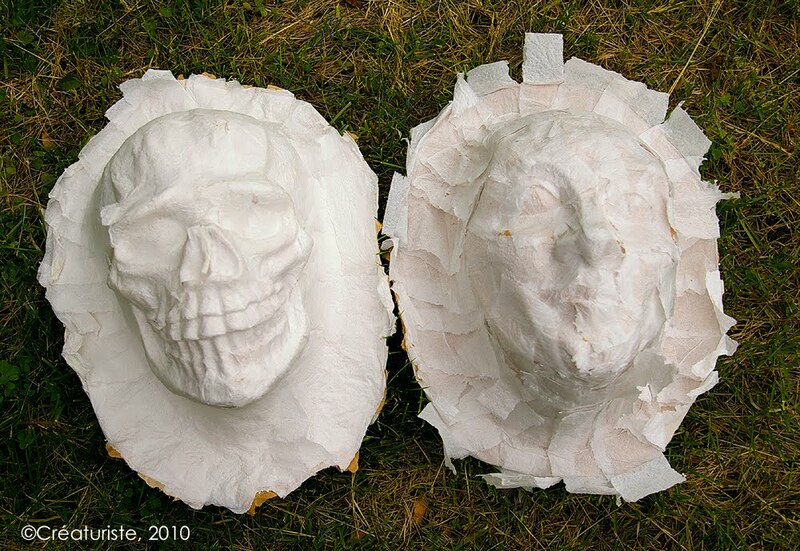 My current test is making two full-face masks out of paper mache strips, using negative molds made of plaster. The release layer (also serves as the "splash coar for details) is a single layer of paper towels (made from recycled paper, quite thin, stays put and works wonderfully) and water. Second and third layer, applied immediately but carefully, are brown coffee filters and corn starch (liquid, not tacky). Fourth layer is thin kraft paper (wetted and wrung out to make soft) and corn starch paste (same liquid consistency). For my future masks, wether I use starch or not, I'll only use coffee filters for the first detail coat, as I found the brown paper towel, when properly softened prior to application, stays put and does not lift. PHOTO at start of post: Skull on the left was the second test, and has better definition than the neutral mask on the right. Difference: I used only one layer of paper towel strips (release-detail layer) on the skull. To keep things simple, I just used water and corn starch. Some people use white glue in the mix, but I believe it would defeat my purpose. Preparation: (please share your own tested-and-true recipes, what I find online is vague and speculation at best). Option one: I added some corn starch to a small quantity of cold water. Mixed as much as possible. Added boiling water gradually while stirring, until mix was more watery than wanted. It thickened as it cooled. No lumps at all. Option Two: same begginning with cold water, then add more, place all in a saucepan, and gently heat while whisking like crazy, to avoid lumps. I wasn't very successful with the lump- avoidance (too hot for too long, probably), but I only made one batch this way. It was still useable. I want to try that one again, because sometimes I want a very thick, tacky glue. The problem with this mix is that it gets thicker with time, constantly requiring more water to be added, and lumps are created that way. •smell is almost undetectable, and is quite pleasant anyways. •seems to create a stronger result (as long as it is dry), so that less paper layers are required for a good structural strength. •re-wettable, meaning a new layer will re-soften a previously dried layer or two. ...Meaning a paper mache session should last until at least the first TWO layers of strong paper have been applied, otherwise warping and shrinkage happen. 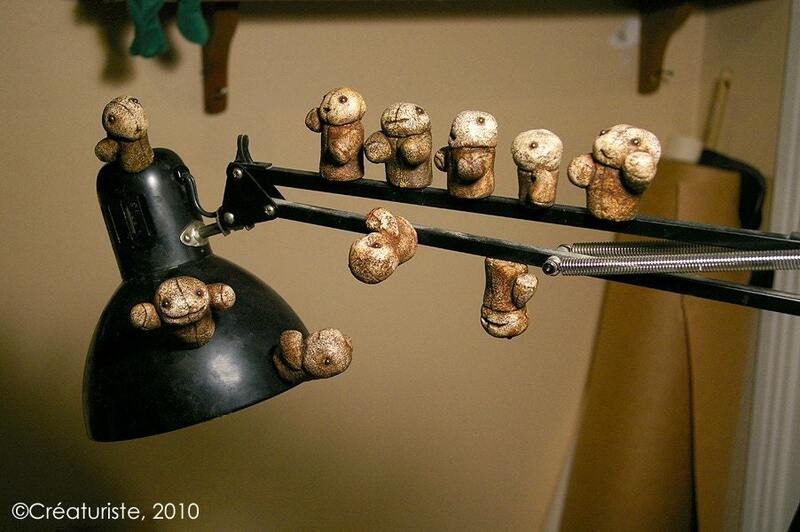 ...so a hollow piece, such as a puppet head or a mask, will sag until dry again. •there is a limit of layers one can safely apply at once without having automatic development of mold on the outside or from within (corn starch+trapped moisture=food for micro-organisms). Information gathered online in a few place reccomends limiting to three or four layers, but that information is vague, as papers vary greatly in thickness and absorption factors. 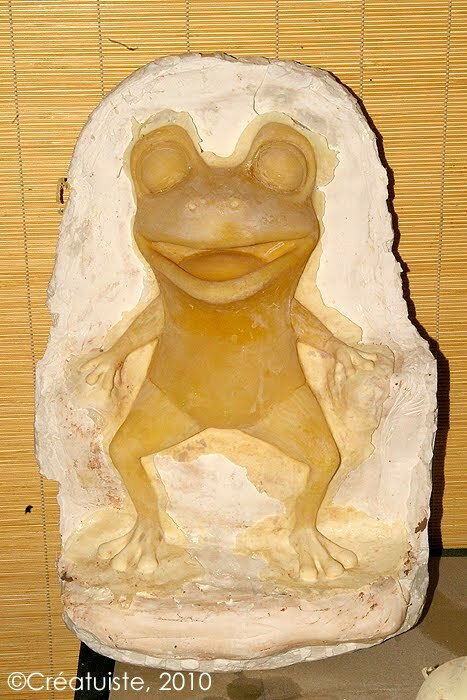 I'm thinking that since I am using a plaster mould, lots of the moisture is absorbed by the plaster. Since my casts remain in the mold for no more than 24 hours (but usually more like 16), I don't see why I should panic. •when using thin papers, previous strips can lift quite a bit when new ones are being added (to the hands or brush), because of the rewettable factor. Mostly problematic on the first layer after the "release & detail coat" of paper and water. •Absolutely needs to be sealed VERY well. Otherwise, the paint job itself can make it soggy and warp it. Or later: accidental spills, atmospheric conditions (even indoors), will damage it in no time at all. 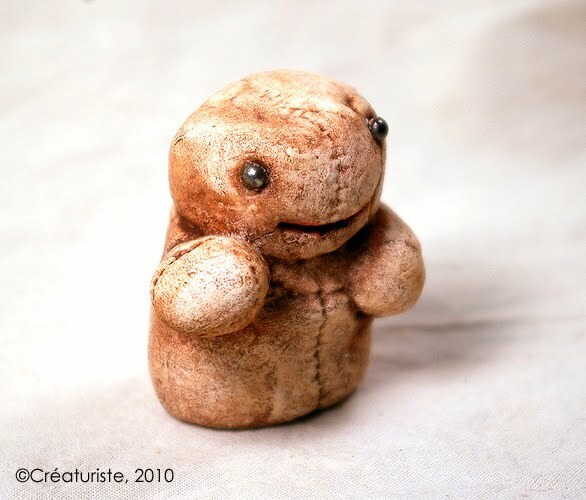 •Seems to shrink a bit more than the same object made using same paper but with white glue. But that might be false, as I haven't cast a copy of either masks in five years. NOTE: the CONS are the same as when using Methyl Cellulose(also sold as Elmer's Art Paste) and its variant, Hydroxymethylcellulose. So solving it for starch might solve it for MC. I wonder what the Bread & puppet Theatre uses to seal/protect their giant puppets made with corn starch. The logical continuation of my process is to keep using natural materials. One of my current test masks needs to go to a customer fast, so I'll have to go back to my usual synthetic material (Weldbond) for the sealing and finishing. At least it is non toxic, and is a good primer for acrylic paint. The other mask can be used to keep testing. Shellac: Seems to be the best "natural" solution that I've seen so far. I do have a local supplier for a water-based shellac, which is used for making "permanent" ink, but it feels too expensive considering the amount I will need to properly seal a mask. It works well on paper for drawings and painting, but on an object, it might be weaker than a traditionnal solvent-based shellac. Wax: might soften my paper mache, will become sticky under hot conditions, scratches easily, and would attract dirt over time. I'd still like to test. Not a priority, unless new information claims to the contrary. Linseed oil: Strong smell, might make project saggy, indecently long time to cure, risk of spontaneous combustion. • I don't know if acrylics will adhere to it (and oils take too long to dry). The logical process would have me use natural paints for this as well, but most bring their own problems, mostly of moisture and scratch resistance. •I've tested it years ago, and I think using my own shellac-based paint (shellac+dry pigments+wood alcohol as a solvent), would ensure complete compatibility. As with most paints I make, to ensure that the finish is no glossier than "satin", or to make it completely matte, I just add more pigment (oversaturate). Still needs to be tested for scratch and impact resistance. One problem remains: I usually reccomend a spray (and/or cloth) of rubbing alcohol to clean/disinfect the insides of my masks. Shellac fears alcohol, will turn white-ish. If anything runs or spills or sprays over to the outside surface of the mask, the finish will need repainting. Even if only the insides get ruined visually, it lowers the beauty and value of the mask. NOTE: it is of the utmost importance to get a fresh shellac to work with. Older than a year-old shellac may not set, ever, and remain sticky. Happened to me. I solved it as best I could by using a wax paint over it. Itmasked the stickyness, and looked good. But the finish transfers to the hand over a half hour of hand heat (it's a wizard's staff prop). Sadly, most shellac companies do not include an expiry date on their product. You may still be able to get the date the store got the can, if you ask an employee of the store to scan it, and see in the system. I believe Zinsser was, a few years ago last time I checked, the only company that had an expiry date on the package. When in a rush and willing to take a risk, I sometimes reach in the back of the shelf, to get the more recent product, if I know that store has good product rotation practices. also, getting the less dusty container may be another clue that it is more recent. Because most hardware stores don't dust every can every week. One way to get away from that expiry risk altogether might be to get the shellac in crystal form, at a paint and pigment supplier. It's extra work (breaking, grinding, heating, mixing, bottling), that I'm not really willing or available to do, though. Again, I would appreciate input and insight! Emailing is better than posting comments. Keep checking this post for updates and more pics. The casts were more trouble than I expected, and I felt I was running out of time to finish one of the masks, so I proceeded to complete both of them using my older, tried and true methods. Which brought more insight into the process. My usual sealer (Weldbond+water) was not reacting ideally with the starched surface. The towel layer was seprating from the first strong paper layer, no matter how much I diluted my glue to penetrate through ad stick. So I had to rip out the paper towel release-detail layer, which I never have to do normally (it becomes part of the final smoothing). This time it created a texture that is a bonus for the skull mask, yet unwanted for the neutral mask. You can see both casts, yet untrimmed and unsmoothed, with a coat of matte paint (acrylic paint, touch of glue, with a bit of drywall compound), which is a good step to reveal surface definition and imperfections. My current tendency would be to wait for further input from colleagues with experience using starch, as for now, after my tests, I see no further direction to take that would solve the problems that starch brings. •Appropriate sealer: requires testing, possibly Shellac. Starch is not a viable option for me, for now. I may change my mind in the future, but I have a feeling I will not experiment any further with this unless I get insightful information about the process. So far, no one has come forward. At least, I don't see it viable for use to cast hollow shapes that do warp so much. White glue and water works very well, so that is what I am going back to. The starch would still work well for pieces that are only covered, and never hollowed out, but Methyl Cellulose works better for this, for my uses. 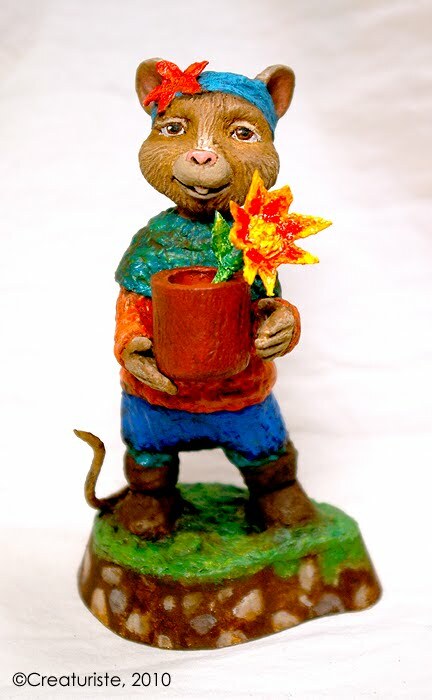 One product of Methyl Cellulose: Elmer's Art Paste. But if you use a lot, some people recommend getting it from a chemical supplier (either as Methyl Cellulose, or Hydroxymethylcellulose). Approx 2,5" x 2,5 " x 1,5 " or smaller. Lightweight non toxic material + acrylic paint, and an embedded Rare-Earth Magnet, so each of them can climb on many metallic surfaces! Appoint them guardians of your important notes! Soon to be on sale on Etsy. Click on the big Orange Etsy button on this page to reach the store. 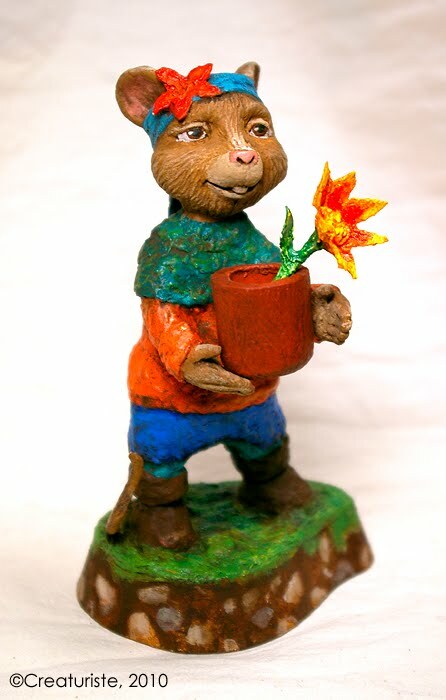 Polymer Clay and Paper Mache over wire armature, on a wooden base, acrylic paint. Rag Doll, designed from scratch around an HD Webcam, so that the doll broadcasts what it sees on a big screen for the audience. Created for a contemporary Dance Choreographer in Montreal. She can sit really stable, at a few angles, thanks to the cylindrical sandbag inside her bottom. Coutil (type of tightly-woven Cotton), polysester thread, sand, plastic pellets, zipper, HD webcam, unraveled twine, and a wash of acrylic paint. 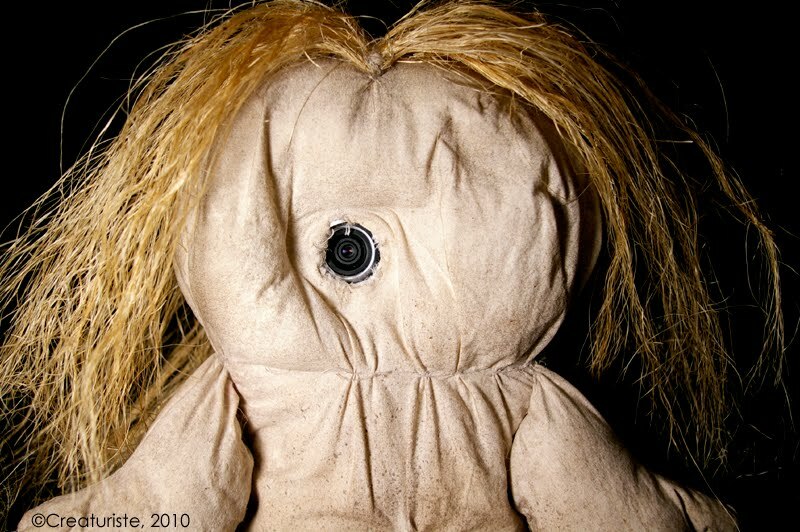 I'd like to assemble another such doll, without the webcam, to keep for myself. I kept my patterns! Customer is taking care of the costume on both, and building the body (a simple stuffed fabric bag) for the fat one. 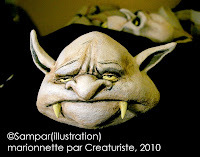 The vampires are built from original illustrations by "Sampar", who illustrated the stories by "Ben". Heres a link to the publisher's page for this book. 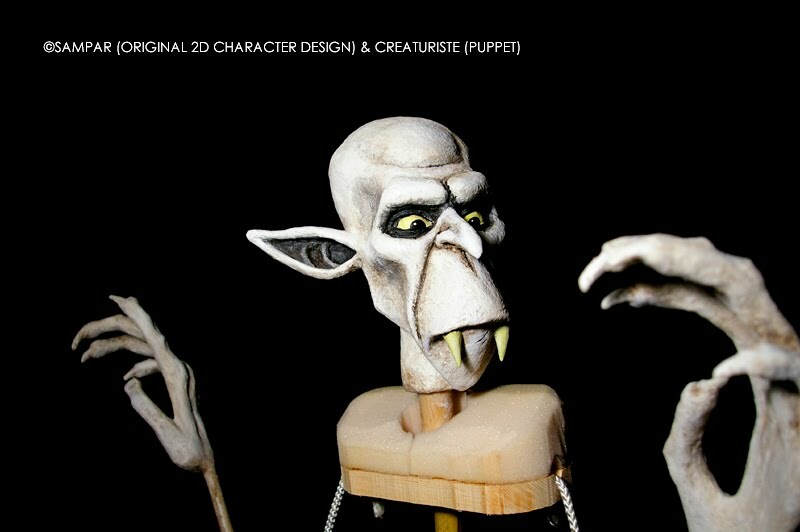 I've been working on Vampire puppets for a storyteller who uses puppets to bring her stories in visual life. With full authorization from writer, illustrator and publisher, I was asked to create puppets based on the illustrations in a book. These are the first two heads I made by using a temporary and reusable wax called Flexwax 120. I like it! 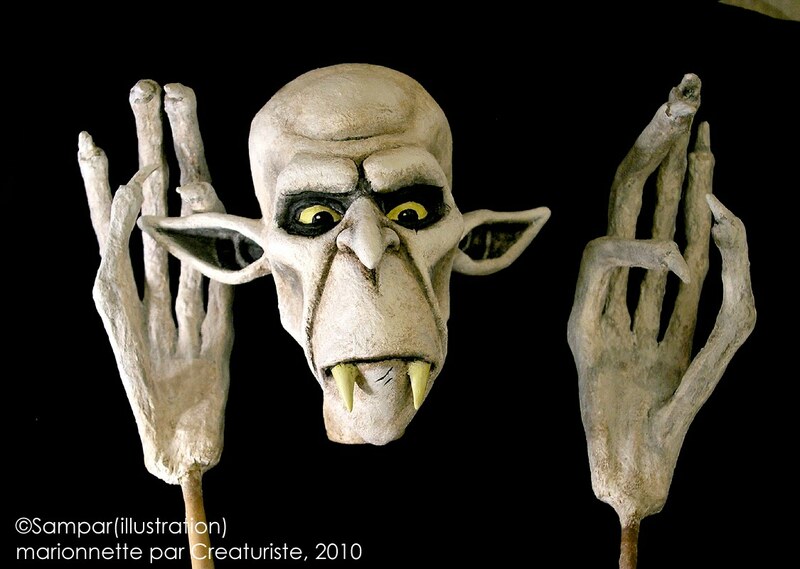 Materials: paper mache (toilet paper for detail, coffee filters for structure, paper towel for skin texture), Monster Bone, acrylic paint, Wood (Fangs, and sticks). The skinny one will be a rod puppet. The fat one will be a bag puppet.